In 1942 I was attending Lincoln Institute, part of Northeastern University part time and realized that I was approaching draft age. I was impressed by the Navy Corsair attack aircraft from Squantum Naval Air Base and decided to join the naval air force. I went into the recruitment office at 150 Causeway Street in Boston. The receptionist told me to take a seat and as I sat there I began to think, "When I walk in that door they're going to start injecting me with needles." The more I thought of this the more nervous I got so I finally got up and walked out of the office. I decided if I was going to get peppered with needles I was not going to do it voluntarily. I would wait for the draft. 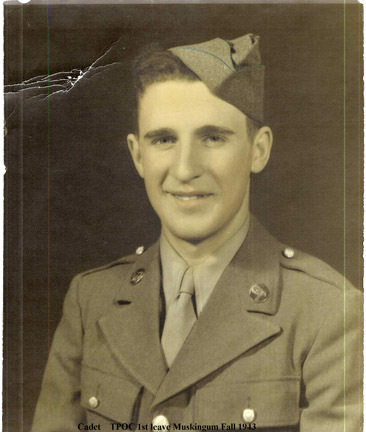 I was drafted in March of 1943 and served three years in the US Army, first in four months of basic training in the Armored Forces Replacement Training Center (AFRTC) in Fort Knox, Kentucky. I was slated for radio school for the second half of the basic training. A radioman was the most dangerous position in a tank as he was the third man to get out through the turret when the tank was hit. Fortunately I didn't go that way. The army came up with a new program called the Army Specialized Training Program [ASTP] which was designed to prepare soldiers with a Bachelor's degree in engineering in 2-1/2 years. Because of my score on the Army General Classification Test I was not transferred to the radio school but given an opportunity to take further tests. Then when I had finished the Basic Training program some of my army buddies and I were surprised to hear that I had been selected to enter the engineering program at Muskingum College in Ohio. Sadly most of them were slated as replacements in existing armored units some in front line units which had experienced large casualties in North Africa. My high school teachers who always said I was not working at my ability were proven right. The military agreed with them that I had the potential to succeed in an accelerated college level program. Things were going well in Muskingum program but time ran out for the ASTP program. It had been designed to prepare needed engineers for a protracted war, but with plans for an invasion of mainland Europe developing it was decided that the army would need the thousands of soldiers who were enrolled in ASTP programs in colleges throughout the country. They were all closed down and the participants were sent to fighting units. The program at Muskingum which was in its third three-month term was terminated in January 1944 and most of the 400 participants were sent as replacements to the 102nd Division in Camp Swift, Texas. I was assigned to the Anti-tank platoon in HQ Company of the Third Battalion of the 405th Regiment. We were among the 3,250 men from several ASTP programs who filled in vacancies in the 15,000 member 102nd Division which had been reactivated from a paper division in September 1942. We trained in Texas until mid summer when we were shipped to Ft Dix, NJ arriving in July. The 102nd Infantry Division in Europe was assigned to the Ninth Army, sometimes called the "Ghost Army" as it was formed quietly from preexisting units. It was give the responsibility of the left flank between the First Army and the British/Canadian forces. In fact for a short time our Regiment, the 405th was attached to the Canadian Second Army in Holland and we got a rum ration. At about that time my brother John was with the Canadian Assault troops at Anzio and Larry was on an LST that had 85% casualties in the attack on Iwo Jima -- a very difficult time for my parents -- especially for my mother who was beside herself with worry and David and my sisters who were home with them. But that's another story. After an overnight stop at the port of Weymouth, England about September 25 our ship anchored of Cherbourg, France and we were unloaded in barges to the shore. We bivouacked in fields near St Mere Eglise until late October. We hiked the fourteen miles to Valognes, France and then were moved by train on "forty and eights". It was a very long train and when it stopped on a curve we could watch the front of the train start moving long before our car moved. Then when the wave of motion reached our car we would have to hold on for dear life -- the car would suddenly lurch forward -- otherwise the shock would knock us down. After three days we arrived at the Tongres, Belgium marshalling area and were trucked to an assembly area near Waubach, Holland. It was here that we were given an opportunity to go to confession as we readied to go into the line. We had finally arrived near the front lines. The initial role of the 405th Regiment was to relieve units of the Second Armored Division who were dug in on the western edge of the Seigfred Line. Its Third Battalion relieved the units in the town of Waurichen. We in the third squad of the battalion's Anti-Tank Platoon were a little nervous and were driven to the town by a driver from the 2nd Armored who was not very encouraging. He had seen a lot of action and just gotten over a siege of battle fatigue. He assured us that none of us would survive, the war would go on forever, we would get bogged down and as time would go by we were all eventually get it. As if to back up his claim we got a glimpse of a German plane through the early morning fog just as it dropped a bomb which exploded in the field next to us. He dropped us of on the western edge of town and took off. We moved through the deserted town to our assigned spots and started digging fox holes in the midst of a grove of what looked like tall willow trees. The ground was so full of roots it was almost impossible to dig, but we scratched holes that would give us little protection from enemy artillery. Then we went back to get our anti tank gun which had been towed into town. We tried to haul it by hand through the woods and over a bridge but soon found that was impossible so were given a more reasonable position near a farmhouse on the edge of the road leading into Immendorf, a German held town. In the morning we learned that two men of the second squad which had placed its gun in an opening in the hedgerow had been wounded by tree-burst artillery. Waurichen, Germany, in the outer fringe of the Seigfred Line was an eerie town. It had always been so and now that the war had crept in and decided to stay for awhile the village took on an even more macabre aspect. Perhaps the artillery which fell sporadically -- uprooting the graves and headstones in the cemetery; digging holes in the crooked streets; laying waste to the livestock whose stiff, disemboweled carcasses tainted the air with that mucky, soddy air odor peculiar to the battlefield -- was the reason for the gloom which seemed to smother the place. Or perhaps it was because as one entered the town the stillness of the situation for the first time came to him when he saw the blood soaked equipment chewed by shrapnel, or the neat little bullet holes in the helmets lying about. Or perhaps it was because the wind blew through the headless trees, fluttering the few remaining leaves into a wild inhuman dance, and gushed through the streets and ruined houses, flapping the shutters and clanking the shingles. This describes perfectly the pervading sense of gloom I felt those first nights in Waurichen. Thankfully this feeling did not stay with most of us through the coming months although there were times of more immediate danger when the feeling wasn't of gloom but of real fear. After that first night one of our noncoms never again raised his head above shoulders. He walked and ran in a permanent slouch. Perhaps the sense of pervading gloom stayed with him, but luckily his stripes didn't. After a while the different units had got established in positions and it became time to move on the offensive. Our anti tank platoon was a defensive unit and as such did not attack with the line troops. And our gun, a 57 mm was no match for the German tanks and accordingly was not much of a defensive weapon. However we did have bazookas and always set it up overlooking no-man's land. So troops from the infantry line company would attack through our position. We were all considered to be infantrymen but those in the line companies were the guys who should be given the credit for fighting the war. At Waurichen our gun's nose was pointed through a thin hedge over a dirt road toward the German lines. I remember the vividly line troops walking slowly at the prescribed distance from each other in the early morning mist carrying their M-1s at the ready. We could see their faces as each one appeared out of the fog and walked silently by our fox-hole and into no-man's-land. Their faces - every one, was ashen. There was no bravado there -- they were scared but the kept coming, slowly walking over the road and into the field carrying their rifles pointing forward at hip level. I suppose since I could have been assigned to a line company instead of anti tank I might have done the same thing, but I still have difficulty understanding how men can make themselves do it. Our platoon stayed at Waurichen for a period playing a back up roll while several units continued to attack German positions. As we were more or less expendable we were used as infantry men on several occasions when there was a need to fill in gaps. It was kind of discouraging though during this period. Each attack would often gain only a few hundred yards of territory and it was such a long way to Berlin. We began to think the 2nd Armored guy who brought us in was right and that we'd never make it. At times we were also used as "volunteers" to carry supplies to units which had gotten beyond into exposed positions and their conventional supply sources. When we were still in Waurichen and some units had moved forward some of us would walk to the nearby town of Apweiler, meet with volunteers from other units and start a pack train of GIs carrying Gerry cans of water and other supplies night after night over the muddy fields to the exposed units. I had a bad cold at this time and had trouble breathing until, finally the Tech Sgt. in charge at Apweiler told me to go back to my unit and take a break for a couple of days. Another time two of the exposed units were B and C companies of our 3rd Battalion which had suffered many casualties attacking and taking a hill near the town of Beek. They had dug in, but there flank was exposed because other units could not manage to secure covering positions on their flanks. It had rained heavily and the broad low fields in front of the hill were so muddy that tanks and tank destroyers could not relieve them. Probably for the same reason the enemy could not attack them successfully. For several nights we carried supplies to their position through the sticky mud. At last it was decided that, since so many of their men had been wounded to take a chance and have litter bearers carry them out during the day. The medics were exhausted so we were asked to volunteer again. We were exposed and being shelled at the time and were a little edgy. One of our guys remembers telling another that he was standing waist deep in water. He was surprised. He hadn't noticed it. Some of the healthy members of B and C Companies had carried their wounded for us at the bottom of the hill. There were more wounded on the hill and Sauer and Katz of my platoon and some others of our group went back with them to get the rest of the wounded. The rest of us took three or four stretchers and started back across the field. The mud was so heavy that carrying the stretchers was very difficult; and my cold was so bad I could hardly breathe. Whenever we'd get shelled everyone would drop the stretcher and head for the nearest shell hole. I was so tired I would take these opportunities to get my breath and kneel right at the head of the wounded guy I was carrying saying Hail Marys. I didn't realize it at the time but one of the guys we were carrying was a friend of mine, Sam Palaskas who had been with me in the ASTP program at Muskingum. After the fighting was over I saw him at a Division function and he came running over to me to thank me. He said he had recognized my voice. I was completely surprised. At this point I was the only one wearing a Red Cross arm band and not carrying a rifle so one of the GIs I didn't know thought I was in charge of the detail and asked if he could go and get a jeep to try to help. He did, and we edged forward through the mud to an area that was a little higher and drier. After awhile a stretcher-carrying jeep suddenly showed up. We piled the wounded on the jeep and it took off like there was no tomorrow. It was a great relief to be rid of the stretchers and to head back to the aid station and to our units. Writing this today in 2005 reminded me to check my copy of, "Our Day" a day to day journal of the activities of our company written by some of the men of our 3rd Battalion HQ staff. This is what they reported; "A.T. platoon [was] used today to go up to the front lines to pick up casualties." Talk about your understatement - they shoulda been there. As I recall my mother some how found out that I was due some award and wrote to the army for it and I received the Citation above. Later she found that additional awards were available for WW II Vets and sent for whatever was due me. I received the following Bronze Star with Oak Leaf cluster. I was delighted because one of my buddies had offered to write one up for me. [If I would do so for him; something I just couldn't do.] So I concluded that somebody had belatedly written me up for an award. Sadly, I later found out that there are two types of Bronze Stars, one for meritorious service and one for heroism. 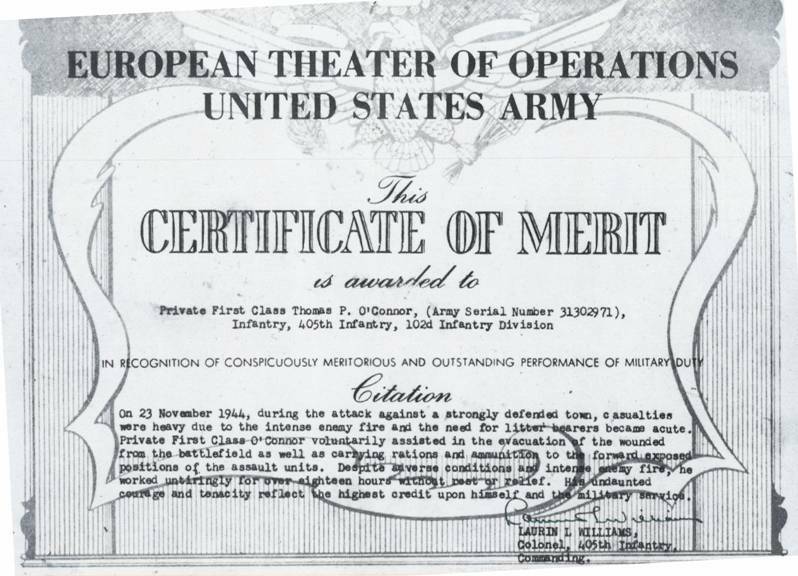 After the war the army decided to convert the above Citation and The Combat Infantryman Badge into Bronze Stars. That's the simple explanation of how I got the Bronze Star with the First Oak Leaf Cluster. As the division made attack after attack we moved from one little town to the next, setting up new positions not knowing where we were relative to our previous location. For the most part we lived a small world, seeing only the GI's in the nearby foxholes not knowing what was around the bend or over the nearby hill. Our driver and vehicle would show up at night, we would attach our gun to the truck, hop on, he would pull us back to the rear and then forward to a new position. During such a move I remember clusters of officers and noncoms peering over maps using flashlights under a tarp trying to identify roads and locations. [Others had found themselves behind enemy lines in similar situations.] When they figured out the roads we would then be deposited in our new position, set up the gun and start digging in. We did a lot of this from late October through November, and into December, when the 102nd took part in some of the heaviest fighting of the war, according to some. This was part of the Seigfried Line lying between the German border and the Roer River - an area of only about 10 X 10 Km. About the size of many New England towns. There were quieter periods of course. When the Roer River was reached there was a period of quiet while units were resupplied with ammunition and personnel. It was during this period that men form our Battalion were able to spend a period of rest and relaxation at a monastery in Rolduc, Holland. On December 22 we were serving as infantrymen in the town of Leifarth when we lost the first man of my squad, Bill Sauer who was hit in the shin by a sniper and was evacuated. There, surprisingly we got the word that we were moving, when we were moving and where we were moving. "The Battle of the Buldge", as it came to be known had started and several divisions of the Ninth Army were withdrawn from us and assigned to the Third Army. The 102nd was given defensive responsibilities for a much wider area. We were to set up on a nearby hill that had a panamoric view of an area, over our lines and behind the enemy lines. AND we had time to prepare the site before moving there. It was near a pill box surrounded by a network of slit trenches just southwest of Leifarth. We went there ahead of time, dug holes off the slit trench and covered them with dirt and doors etc. from the houses in town. Our hole was large enough for four and we had plenty of blankets so we built ourselves a cozy warm nest. With four men to share sentry duties life was easier. We had what was called, "Ten in One" ration which was a single package with enough food for a squad for one day. It included oatmeal which had to be heated by a propane burner that didn't always work. It would be the highlight of the day when Cpl. Scavone would succeed in getting the burner going so we could have hot oatmeal with powdered milk. On one side of the hill there was a gully that ran down to Leifarth where our Platoon CP was located. Every evening my buddy, Wendell who was short but quick and who didn't usually volunteer would take off at dusk, running like a deer across the field and down the gully to get supplies. We were there over Christmas and New Years with only an occasional shell to interrupt our leisure. After the Germans were stopped at Bastogne the 102nd started attacking again and we moved to the village of Rurdorf overlooking the banks of the Roer River in preparation for the next major goal, crossing the Roer. One night our squad was quartered in a cellar on the main street of the village and Wendell and I were standing guard at the door. Suddenly we heard what sounded like small arms fire from around the corner of the building. We investigated and found that our truck which was parked there had been hit by a shell and all the ammunition was exploding. We reported it to our platoon leader and he and the driver went to investigate. The driver rescued his shaving kit from the truck and he and the platoon leader were awarded the Bronze Star for their bravery. Again the anti tank platoon was used as carriers -- this time to carry boats down the steep ravine to the river's edge. My group went to Flossdorf the next town but for some reason we were not used. The group that carried the boats at Rurdorf had a rough time of it and one guy in our Platoon, Vanderslice was killed. The crossing of the Roer was preceded at about two in the morning with probably one of the most intense artillery assaults of the war and the enemy answered in kind if not degree. Luckily we were in cellars for this. The engineers and line companies had major problems crossing the river as the Germans had opened the flood gates up stream and the current was very rapid. Many boats and alligators were overturned and the troops scattered. Of course we couldn't get our gun across but by mid afternoon a pontoon bridge had been set up and we were able to cross single file with the rest of the troops and with our bazookas as the only defense against German tanks. It was a very precarious situation for the whole division which had crossed during the first day and night and was vulnerable to a counter attack. We set up our position at a main intersection in the town of Boslar but unlike Rurdorf there were no cellars. We were in the front room of a home with large windows with little protection. There were large bags of chaff which we placed in the windows. Of course they would be of no protection at all except psychologically. We could hear the tanks rumbling down the road and tried to set up our bazookas. The barrels of bazookas come in two sections carried by two men and are fitted together by turning grooves in one half to slots in the other. When we went to put them together we found that the two halfs were from slightly different models and didn't fit right so we stuffed match book covers in the slots. The problem was that the firing mechanism depends on an electric current generated in the front half passing through to the bazooka rocket in the back half. We were not sure if the bazooka would have fired or whether the match book covers would break the circuit. Fortunately the tanks were turned back and the bazooka was never tested. The Germans had counterattacked with tanks and armored vehicles and the counter attack appeared to be succeeding so Division decided that rather than lose the whole bridgehead they would call for an artillery attack on our own forces. As a result we were subjected to the most violent barrage imaginable. For forty five minutes the ground shook steadily - the roar of the shells was worse than the thunder of continuous lightning strikes immediately overhead. We thought we'd never survive. Artillery batteries of the different calibers and range had been set up in the rear at varying distances depending on the range of their guns. Their fire was then timed so that all the shells would hit the target at the same time. When all this firepower was extended upon one little town the effect was terrifying, for us as well as the enemy. It made us wonder how the Germans were able to resist this sort of attack as long as they did. This time they backed off and were spared exposure to our bazooka. As we moved beyond the Roer, then the Rhine and to within a few miles of Berlin the division took larger bites of territory with each attack. This was made easier at times by the amazing development in artillery techniques during the war. Shells that hit the ground have limited impact against infantry troops, as much of the blast goes into the ground and the fragments that go above ground are scattered and can't reach men in foxholes. Tree blasts are very effective because the shrapnel of shells that go off in the air spreads over an area and can penetrate foxholes. Of course troops know this and avoid trees and orchards when possible. Our artillery developed skills using timed and sensor shells that could be set to go off just above the ground. They also had the ability to move the field of fire ahead of attacking troops. I saw an example of how unbelievable this is when I happened to be near Colonel Bischoff our Battalion commander watching an attack on a small town. The troops were moving slowly across a field toward town firing their guns from the waist. Meanwhile artillery burst were striking in the air in what seemed like a just a few feet in front of them. The Colonel was having a fit, screaming at the nearby artillery forward observers, "lift the barrage - lift the barrage, cease fire." -- or something to that effect. But they persisted. The barrage moved steadily forward like a rain shower into the town, with the troops walking steadily behind it. Needless to say there was little or no enemy resistance. The whole thing was a demonstration of a technology that was amazing to see - for me -- and obviously for the Colonel. As we neared Berlin and enemy resistance weakened the strict military discipline relaxed and we began to "liberate" some German property. Of course it was supposed to be military property and some of it was. A. L. Moore of our platoon, who after the war became a very successful entrepreneur -- he developed a chain of forty wholesale plumbing hardware stores in Texas and nearby states --, acquired a German military Volkswagen. Major Myers, Asst. Battalion Commander pulled rank on Moore, took over the Volkswagen and I was drafted to drive it for him. That meant I had to stay in HQ house with Major Myers, Colonel Bischoff's and his jeep driver. In one German town in which we stopped for a short period Bischoff and Myers had taken over a large private home from the German residents but allowed a young Dutch girl to stay as housekeeper. The colonel's driver and I had to hang around until they needed us while our buddies with little to do could explore the area. The Dutch girl and I had a lot of time to talk. She told me that when the Germans had occupied Holland her father who owned a fleet of taxis had stored some petrol underground in his back yard. I forget what happened to him and the rest of the family but this fifteen year old girl and her younger sister were taken to Germany as slave laborers. She felt fortunate because the family she worked for treated her humanely. But tears would come to her eyes when she spoke of her younger sister. She worked on a farm doing laborious work with little food for people who were not so nice. Her sister tried to get some extras to her but it was very difficult. The fifteen year old also swore me to secrecy about another thing; there was a man of military age with a minor physical handicap who had ingratiated himself into the good graces of our two officers. He was spending a lot of time in and around the house being very helpful to them. She quietly told me that he was an SS Trooper. She was afraid of him and I was not to tell anyone because she was afraid that even though the war was almost over he would "get" her and her sister. Although I was tempted to tell I kept my promise and never told anyone. During that time and until the end of the war I would drive Maj. Myers wherever he wished. One day we went to the Elbe River where thousands of Germans people were trying to cross to our side [mostly unsuccessfully] and thousands of German troops who had surrendered were crossing. The roads to the river were so filled with German troops that we had to crawl along the edge of the road to get by. We also went to Gardelegen were the 407th had discovered a large barn in which over 1000 war and political prisoners had just been herded and then burned alive. The guards had covered the floor with gasoline soaked straw, herded them in, set up machine guns near the doors and set fire to the straw. It was the most horrible sight I ever saw. When we arrived at Stendhal near the Elbe River the war was over for all practical purposes and soon we would be serving as occupation troops. We waited there for two weeks for the Russians to reach and take over Berlin. After May 7th when the war ended we were assigned the new role and moved by a series of steps to an area near Nurnberg. First the Division had the responsibility for 120,000 German troops who had surrendered in droves to avoid the Russians plus thousands of Allied soldiers and tens of thousands of displace persons or slave laborers. Our battalion was not very much involved in that and by the end of the month the British Army took over the area and we moved to the town of Stadtilm for long enough to make some friends even though "fraternization" was forbidden. We left there shortly feeling sorry for the people we had met as that was going to be the Russian Sector. The Volkswagen was left at Stendahl so I was back with my platoon until the next town Ilmeneau, a beautiful little ski resort town. There was a nice little sports car in the garage of the house we had commandeered and when Colonel Bischoff decided to take it I was drafted again. We got orders to immediately move to southern Bavaria and I remember driving along the autobahn with just the Colonel heading south. He probably didn't want to take the sports car in a military convoy or maybe he just wanted to get there ahead of the convoy. Soon orders came down to relinquish all confiscated private vehicles and the sports car was gone. However in July when Major Meyers took over from Bischoff he acquired got the use of a door sedan but he must have drove it himself as I stayed with my platoon. The 102nd was now in Niederbayern or Southern Bavaria and my battalion was in the town Pfarkirchen on the banks of the Inn River. There my perennial bout of tonsillitis kicked up so badly I had to be hospitalized. That meant riding for miles in the back of an army truck. The regimental doctor said I had to have them removed and he would schedule surgery but it never happened. I had the tonsils removed after I was discharged and it cost me $90.00, a large sum at the time. I was pretty sick when I got to the field hospital but there was one guy there lying on a stretcher -- there were no beds - who I was sure was dying. The next morning I was amazed to see him up and walking around. He had been given the new miracle drug penicillin. 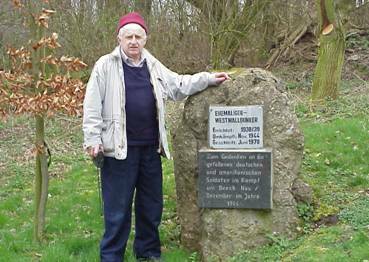 When I got back to my unit we had moved to nearby Eggenfelden where we were all together in a hotel. The army was still shuffling units around though and we soon moved to Franconia or Upper Bavaria where we were located in a factory office building. There we used to gather around Don Guiney on the piano and sing for hours. Sometimes the Major would call me to drive him and his friends. I remember one night when I drove him and a bunch of officers to the officers club in, I think, Bayreuth and hung around outside while the officers and girlfriends partied danced inside. Non-fraternization was breaking down some at the time but I cannot now say for sure that the female dancers were German. I do remember driving home that night in the fog and the cracks in the road ahead of me would turn in to the rear ends of big trucks. I don't think my passengers were in any shape to notice my sudden unnecessary stops. Another time the Major called me down to his office. He was sitting behind his desk when I reported and saluted in true military style. To paraphrase he said,"O'Connor, I was out hunting today and got my boots muddy. They and my rifle need cleaning. The boots are by the front door." My face got red as a beet but I didn't know what to say. I knew I wasn't going to clean his boots or be his Bat Boy like those of the British and Canadian officers like my brother Gene had. Finally I looked him straight in the eyes and said, "I'll clean your rifle, Sir." I don't know what was going through his mind but he stammered something to the effect that he would take care of it and dismissed me. When I got back to my unit they were offering six day leaves to the Riviera so I took one. Kennedy who was our truck driver jumped at the idea of driving for the Major until I got back and when I did get back he never mentioned it again and neither did I. I never found out if he cleaned the Major's boots. Next we moved to Neustadt on the Waldnab, a little town famous for its porcelain figures. Neustadt means new town and there are at least seven Neustadts in Germany so they designate this one by the river it is on, the Waldnab. Non fraternization had just about broken down by November 1946 so we had an enlisted men's club where we went most every night and partied and danced mit der fraulines. My squad leader S/Sergeant Hunt earned enough points to go home so I was made Sergeant and later S/Sergeant. We were in Neustadt for Christmas through New Years until late February when I too had enough points to go home. I was transferred to the 407th Regiment as it was being shipped to Le Havre in Normandy and home. We arrived in New York Harbor which we had left on September 12, 1944 on March 7, 1946. I was discharged at Camp Devins, Massachusetts on March 21st just three years and three days after I was activated there. The Army Specialized Training Program ("ASTP") was established by the United States Army in December 1942 to identify, train and educate academically-talented enlisted men as a specialized corp of Army officers during World War II. Utilizing major colleges and universities across the country, the Army provided a four-year college education combined with specialized Army technical training over a period of one and one-half years to those enlisted men who were accepted into the program. The men of the ASTP were distinguished by the octagon shoulder patch insignia of the program which was worn on their uniforms (shown below). It depicts the lamp of knowledge crossed with the sword of valor -- an allusion to both the mental and physical capabilities of these specialized officers-in-training. ASTP soldiers were to serve as Army officers in both the successful prosecution of the war and the restoration of civilian governments in Nazi-occupied Europe after the war's end. But due to the impending invasion of Normandy and the need for additional manpower in its ground forces in Europe, the Army disbanded the program in early 1944. Most of the ASTP soldiers were then assigned to the infantry, where they fought in the European and Pacific Theaters of Operation. The above story, "It's My Story and I'm going to stick with it", by Thomas P. O'Connor, AT Co., 405th Regiment. The story is re-printed here on World War II Stories -- In Their Own Words with the kind permission of Mr. Thomas P. O'Connor. Our sincerest THANKS to Mr. O'Connor for allowing us to share his story. Original Story submitted on 22 April 2006. Story added to website on 1 May 2006.